From its origins as a wholly voluntary organisation, the Library has grown into a thriving 13-woman team, working on our learning programme, with the collection, and keeping the Library running. 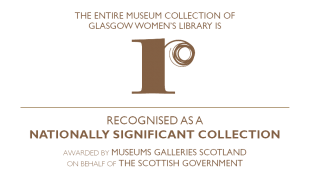 Our Board of Directors furthers the work of Glasgow Women’s Library by playing an active part in strategy development and the meeting of the organisation’s mission and aims. Glasgow Women’s Library’s paid Staff Team is supported by many people who make up our ‘Broader Team’, usually as volunteers. Our dedicated ‘Broader Team’ always brings a diverse range of skills and talents to the Library, ensuring it operates successfully on a day-to-day basis. Volunteers are very important to the Library and we are keen to encourage women who wish to support the Library in this way to contact us. Find out more about our volunteering programme.